The Faculty Seminar in Writing Instruction provides a small group of Cornell faculty an opportunity to explore the relationship between teaching and writing while developing or refining new or existing courses. Participants receive a $2000 stipend. The deadline for applications is March 22. Facilitated by Dr. Elliot Shapiro, the 2019 Faculty Seminar will consist of an intensive two-day seminar held on June 5 and 6, followed by two intensive workshop days on June 11 and 12. The seminar days will focus on exploring frameworks for teaching writing in a range of courses. The workshop days will focus on reviewing draft materials produced by seminar participants and shared with the other members of the group. The seminar will have no more than eight participants. Participants are typically either working on a new course or revising an existing one. These courses may be designated as writing courses but they need not be. We welcome applications from faculty of any rank; we particularly invite applications from faculty who are new to Cornell. Stipend: Participants receive a $2000 stipend. • Participate in two intensive seminar days scheduled for June 5 and 6, and two intensive workshop days scheduled for June 11 and 12. Preparation for the seminar sessions will include preliminary reading and writing. In preparation for the workshop days, participants will produce (or substantially revise) course materials to be shared with seminar members. They will also review materials produced by the other participants. • Write an evaluation of the program after it is completed. 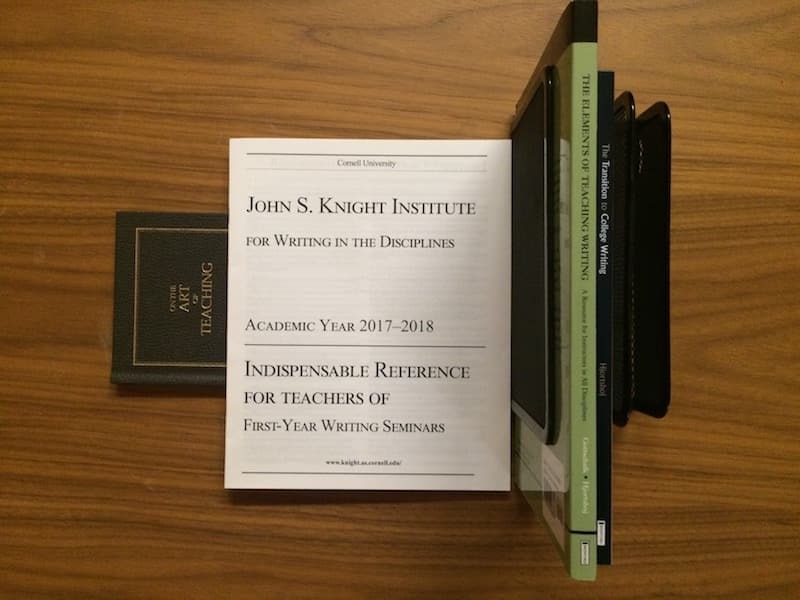 • Fulfill modest service expectations: this will include judging submissions for Knight Institute writing and teaching prizes submitted following the Spring 2019 and Fall 2019 semesters. Committees to choose prize winners will likely meet several weeks after the respective semesters end. • Application letter. The application letter should describe your interest in the seminar and explain what you hope to accomplish during the seminar. For example, an instructor teaching a new course might describe the course; the role writing might play in it; and how the seminar might help prepare for it. Please indicate how you learned about the seminar. • A brief sample or samples of professional writing. The writing sample (or samples) may take any form or genre: they may be published pieces or works in progress. (If you would prefer that writing samples not be shared please indicate this). • An edited sample of teaching materials related to writing. Please do not submit all the materials for a given course. Provide some context for these supporting materials in the application letter or in a cover note that deals specifically with the teaching materials. If you have questions about the seminar, please contact Elliot Shapiro at elliot.shapiro@cornell.edu. First-Year Writing Seminar instructors interested in free, private consultation are invited to participate in the Essay Response Consultation program. In this program a writing specialist or tutor reads a set of papers on which an instrcutor has commented, and then meets with the instructor for a one-to-one consultation about questions and insights regarding response to student work. Less formal, consultations on teaching are also available; when a brief, informal meeting in the midst of responding to a set of papers, or developing a lessson plan, or designing a writing assignment could clear up temporary confusion and restore a balanced perspective, you should schedule an appointment at the Graduate Writing Service. If you hear of any other strategies that have worked particularly well, please share them with us so we can pass them along to others. And if you wish to arrange for either an Essay Response Consultation or for some special assistance for a student during the semester, please contact Dr. Tracy Hamler Carrick. During the academic year, faculty members from the departments offering First-Year Writing Seminars act as course leaders for graduate students who are teaching seminars. Course leaders continue the support and training begun in "Teaching Writing" by holding regular staff meetings, visiting classes, reviewing papers comments, and so on. An important mechanism for encouraging a heightened level of self-awareness surrounding questions of disciplinarity and the teaching of writing has been the "Peer Collaboration" program for graduate students, a program previously initiated by the current director as a course leader in Comparative Literature which has since been instituted across the Institute as a whole. The peer collaboration program has the pedagogical advantage of encouraging teachers from within each discipline to define and discuss their own terms for what constitutes successful writing in their chosen fields. Collaboration among peers from within the same field, as well as across fields, has the additional advantage of avoiding unhelpful disidentifications with authority figures from other fields (English in particular) which a writing-in-the-disciplines based approach must circumvent if it is to avoid unproductive forms of discipline-based resistance. During the year, Teaching Assistants may collaborate with other, perhaps more experienced Teaching Assistants as part of a recently developed peer-collaboration program. Projects might include visiting each other's classes, team-teaching, or acting as guest instructor. Faculty act as consultants, approving the proposals for peer collaboration, attending one or more lunch meetings, and submitting the final reports from the collaboration to the Knight Institute Office.